Uncategorized / Call for 2017 Mardi Gras Theme! 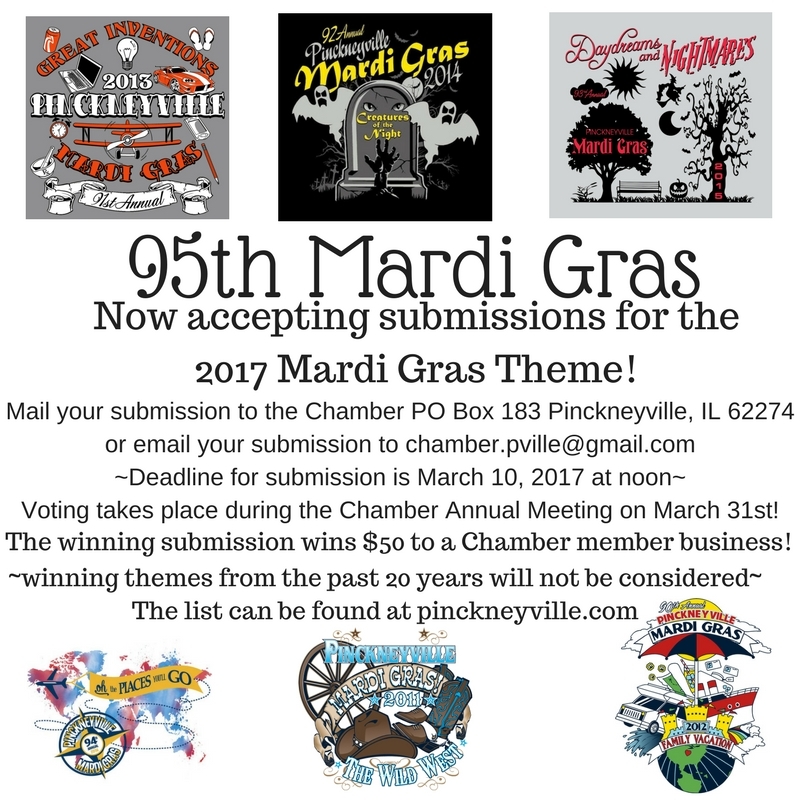 Call for 2017 Mardi Gras Theme! The following themes have been used over the past 20 years and will not be considered: Through the pages of History, Hooray for Holidays, Echoes of a Century, Reflections of Time, Set Sail with the Holidays, A Salute to America, Happiness Is…, Symbols of America, Silver Screen Heroes, Bring on the Music, Woodstock, Disco Fever, Music on Parade, Movie Memories, The Wild West, Family Vacation, Great Inventions, Creatures of the Night, Daydreams and Nightmares, Oh, the places you’ll go. 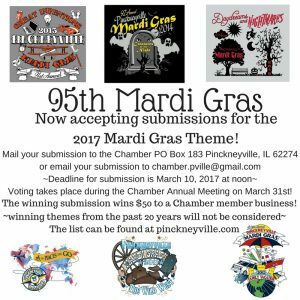 The submitted themes will be narrowed down to the top ten choices by the Pinckneyville Chamber Board of Directors. The ten top choices will be brought to the Chamber Annual Dinner on March 31st, and all in attendance will get to vote on the theme. You will be notified if your theme is one of the top ten! 2017 Person and Business of the Year NOMINATION TIME!